Quirky & fun, this is the the author’s favorite ‘Rivers’! 2 hired thugs, 1 sheriff, 2 unlikely friends, 1 court appointed nuisance– what could possibly go wrong? This humorous adventure is about the bonds between brothers– even unintentional ones– & the many hiccups of life. 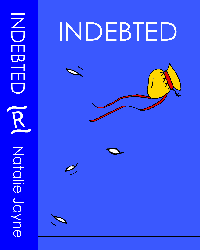 INDEBTED is a ‘clean’ read. Except for Gideon, who can ruin a new set of clothes in 3 sec. flat, pinch the blue ribbon prize & still skid calamitously into town by supper. Intelligent and witty, INDEBTED is insightful in a way that holds true not only for its loosely American West setting, but for today’s coffee drinking Joe as well. This descriptive story is told with a ‘sitting right beside you on the couch’ feeling. Second in series, but titles can be read in any order.